Explosive Jamaica and West Indies opener Chris Gayle. 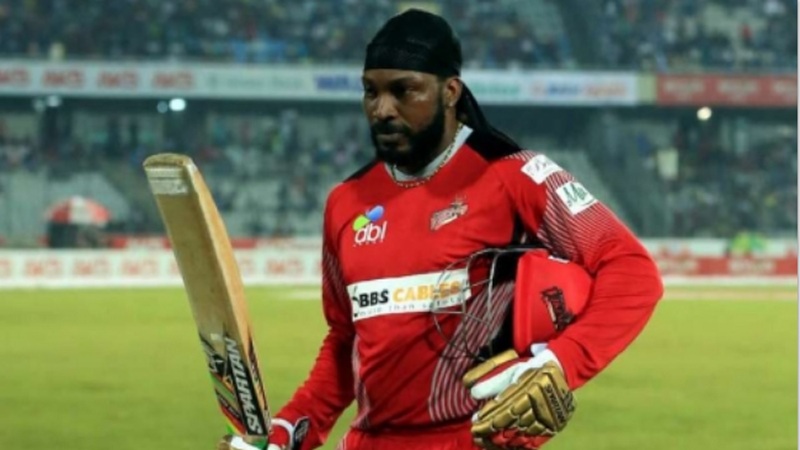 Explosive Jamaica and West Indies opener Chris Gayle was dismissed for 21 from 17 balls as his team Kings XI Punjab suffered a 31-run defeat against Kolkata Knight Riders (KKR) in a run-feast Indian Premier League (IPL) match, on Saturday. The West Indies pair of Trinidadian Sunil Narine and Jamaican Andre Russell, with an all-round performance, set up the victory for KKR. Pinch-hitter Narine bludgeoned four sixes and nine fours to make his biggest IPL score of 75 off only 36 balls and captain Dinesh Karthik struck 50 from just 23 in KKR's mammoth total of 245 for 7 in Indore. Russell supported well with 31 from 14 balls. Andrew Tye took 4 for 41, but it was a gruelling day for the Kings XI bowlers, KKR posting the fourth-best score in IPL history. 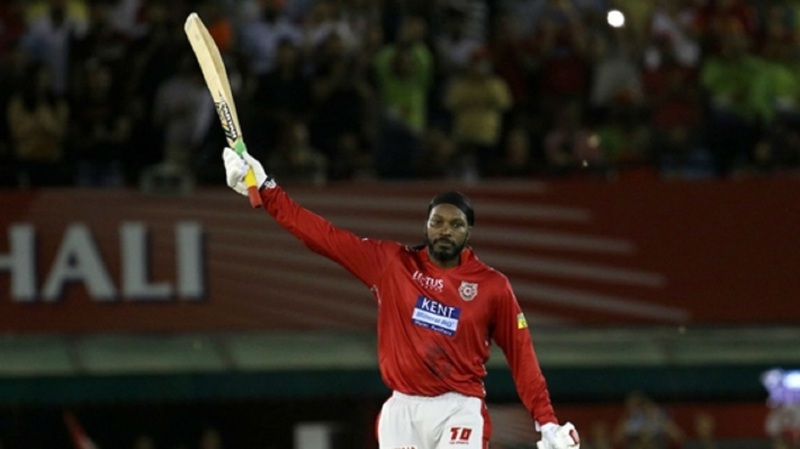 KL Rahul hit a third consecutive half-century, but any faint hopes of Kings XI pulling off an unlikely run chase were all but ended when he played on to a Narine delivery for 66 from only 29 balls after striking seven sixes. Andre Russell took three for 41 as Kings XI, chasing 246 for victory, finished up on 214 for eight following a late Ravichandran Ashwin (45) cameo to go down by 31 runs, striking a blow to their play-off hopes and enhancing KKR's chances of qualifying. Narine has been hit and miss at the top of the order and was due a good knock after falling for single-digit scores in his last two matches. The left-hander justified his opening berth, adding insult to injury after Mujeeb Ur Rahman damaged his thumb trying to take a catch off his bowling when Narine drilled a half-volley back at him. Ashwin bowled the remainder of the fourth over with Mujeeb off for treatment and the captain's first two balls were smashed for six and four. Narine cut loose after Chris Lynn (27) fell, racing to his half-century off only 26 deliveries, eventually falling when he was caught behind off Tye in the 12th over. There was more suffering to come for the Kings XI bowlers following Narine's departure, Karthik and Russell putting on 76 in just five overs. Russell put the expensive Axar Patel, whose four wicket-less overs went for 52, onto the roof in a 15th over that cost 19 runs and Karthik set about Mujeeb, who must have wished he had stayed off the field when he was taken for 21 in the 16th. 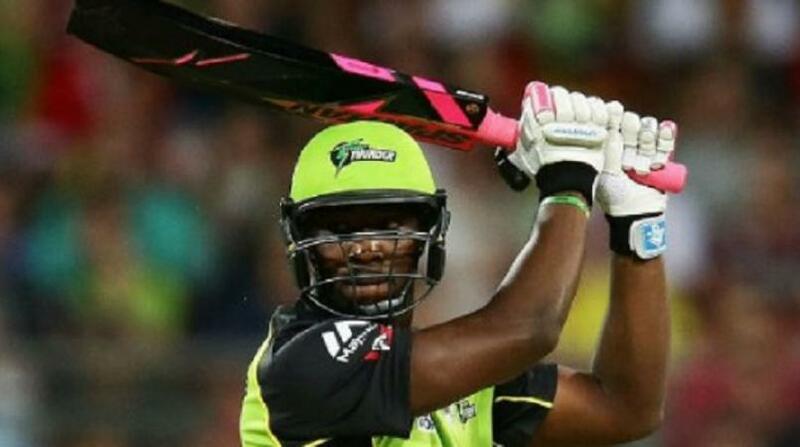 The clean-hitting duo both cleared the ropes three times and debutant Javon Searles hit his one and only ball for six over long on to finish off a devastating KKR batting performance in style. Rahul made 95 not out and an unbeaten 84 in his previous two matches and maintained his outstanding form to give Kings XI hope. The India batsman struck Narine for back-to-back sixes in the first over and motored on after Russell struck twice in as many balls to remove Gayle, after the Jamaican had hit two fours and a six, and Mayank Agarwal. Rahul slashed a short ball from Russell for a maximum to reach his 50 from only 22 balls and hit Narine for another two sixes in an over, but the spinner had the last laugh when the opener made a mess of an attempted sweep. Ashwin produced some fireworks with a brisk 22-ball knock, but Kings XI were made to pay for a poor display in the field.